Sometimes you can’t settle for anything but the best. If you play soccer regularly, you know that even the smallest advantage can be the difference between winning and losing. One area you can gain an edge on your opponents is in your choice of footwear. You’ve heard the old saying “you get what you pay for” so, with that in mind, we wanted to provide a list of the most high-end soccer shoes money can buy. 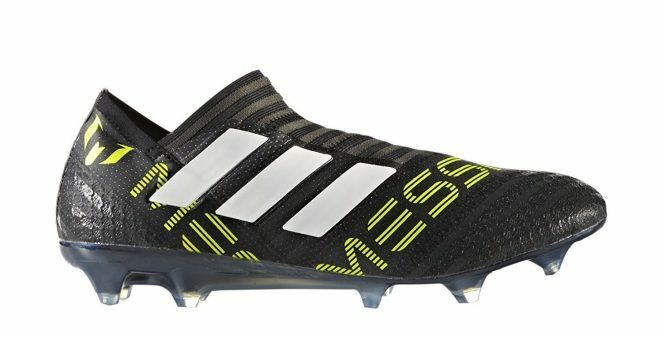 Check out this 2019 edition of the Top 15 Most Expensive Soccer Cleats, complete with reviews of each soccer boot. The Hypervenom Phinish will deliver the speed and striking control you’ll need to dominate play on the field. The Flywire cables and dynamic fit collar wrap the foot to enable a supportive, snug fit, ensuring your foot doesn’t slide in the shoe while making quick cuts. The shoe features a Nylon chassis with a Pebax base for a supportive and responsive feel. The TPU-tipped studs allow for excellent traction when you need to grip the earth on quick turns and lateral movements and the NIKESKIN technology in the textured upper ensures superior control of the ball. The molded sockliner cushions the ankle and reduces the impact of the studs, ensuring a comfortable experience when running. The first step to playing like Messi is lacing on the cleats he uses. The adidas Messi Mirosar10 10.1 FG Soccer Cleats are designed with an ultra-soft, one-piece HybridTouch Synthetic Upper that provides support and lasting shape retention. The shoe is an incredibly lightweight 165 grams, allowing you to forget about what you’re wearing and focus on making plays. The upper also includes a 3D DribbleTex Pattern which provides additional fricion for superior ball control at high speeds. A 3D-Moulded TPU FitFrame enhances the stability of the heel area, ensuring your foot is snug, locked-in, and ready for competitive play-making. The new SpeedTraxion Stud Configuration will give you a boost in precise lateral movements, offering 14% more traction for quick changes in direction. miCoach Compatibility also allows you to monitor training sessions and game-day performance so you can track you’re progress toward playing like the master. Gain the traction needed to outmaneuver any defender with the adidas Questra III TRX FG Soccer Cleats. Made of durable, synthetic leather, these shoes offer comfort and stability. 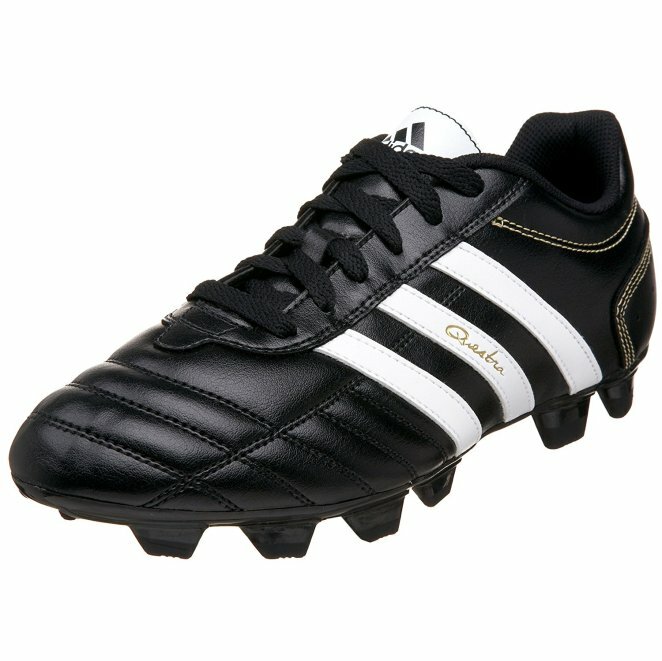 The classic adidas soccer style of this shoe provides all the elements of premier, modern soccer performance. It is specially designed to provide enhanced traction on firm ground, grassy field playing surfaces. The sophisticated Traxion System and TPU shank provide increased agility and ball control. The adiPRENE in the heel absorbs the shock of the cleats and cradles the foot, ensuring your feet don’t wear out over the course of a long soccer season. 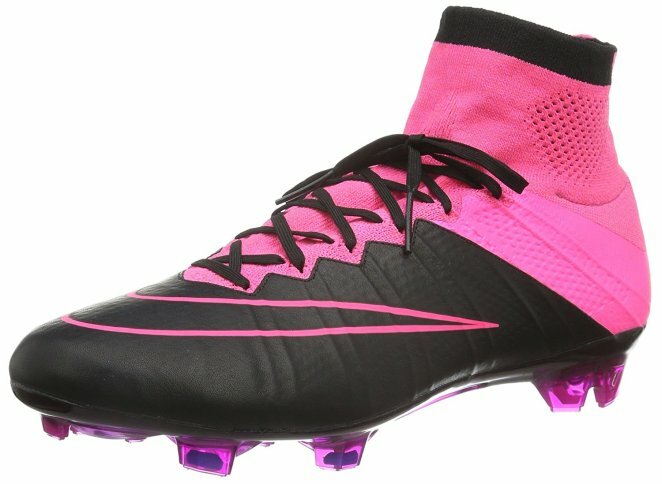 While most other cleats in this list are made for firm ground play, this is the set of cleats you want if you need quick movement on artificial ground. 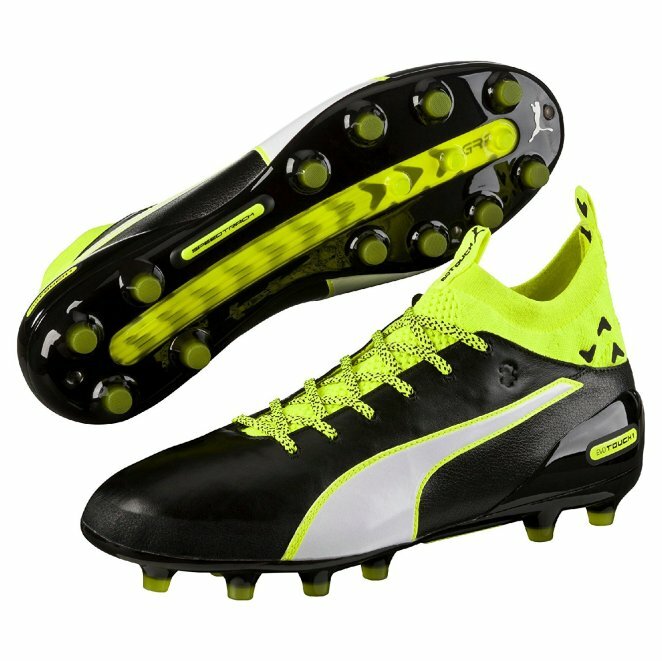 The PUMA evoTOUCH 1 AG soccer cleats utilize a soft calf leather upper and an evoFIT knitted sock, which ensure your feet are snug in the shoe and ready for quick movements and bursts of speed. In addition to the grip of the knitted sock and leather, the evoTOUCH 1 features PUMA’s GripTex technology to further eliminate any movement of the foot in the shoe, allowing you to stop on a dime and make sharp turns when needed. The shoe’s outsole features a SpeedTrack spine to allow for improved reaction time and the canonical studs are the perfect traction for artificial ground play. The NIKE Men’s Magista Opus II FG Soccer Cleats will make you the dynamic player you want to be in your firm ground soccer games. They feature a hybrid tongue design which allows for a snug fit and cuts down on any possible movement of the foot within the shoe. On key areas of the shoes there is a 3-D performance mesh texture which ensures targeted friction for precision control of the ball. The circular pivot zone in the forefoot area of the shoe is made for quick, stop-and-go playmaking while the interior heel counter cushions the foot for a stable and locked fit. The EVA sockliner comes with PORONÂ inserts for added support that relieve stud pressure and improve comfort. The notched studs in the heel area provide extra gripping power for quickly stopping and changing directions. Create utter chaos for your opponents with the adidas X Purechaos soccer cleats. 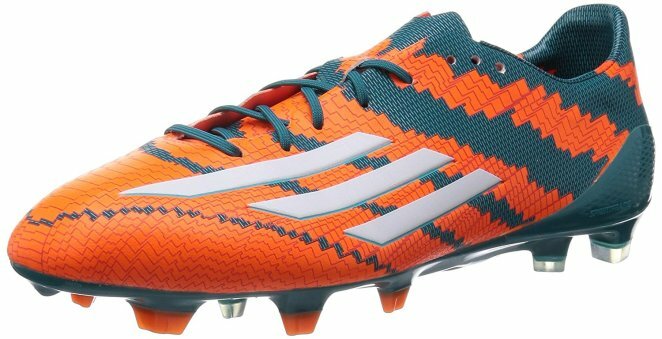 These shoes are designed for soccer players who blow past defenders with speed and agility. Featuring a techfit upper that molds to your foot, there is absolutely no break-in time with these shoes. The techfit collar stabilizes the ankle for a supportive, locked-in fit. The shoes feature a covered forefoot, allowing the laces to sit inside the shoe, increasing the accuracy of strikes on the ball and reducing the chance of an errant pass or shot on goal. Specially designed Non Slip Grip (NSG) is a layer of raised dots on the shoe’s upper that increases control of the ball. The Lightweight SPRINTFRAME outsole and Purechaos heel lining add stability even at your top running speed. The alignment of studs on the FG Chaos is specifically designed for total control during all out sprinting and agile maneuvering on firm ground surfaces. Velocity is key in the fast-paced game of soccer and the Nike Mercurial Veloce III DF FG Cleats will ensure you stay a step ahead of your competitors. The Dynamic Fit collar keeps your ankle locked enabling better ball control and awareness. The contoured, perforated sockliner provides extra comfort, reducing the impact of the cleats on your feet. Enhancing your touch, embossed horizontal ridges provide accurate control of the ball. The TPU overlay on a nylon plate increases the durability of the shoe. Achieve your top speed while leaving opponents in the dust with a pair of the Adidas X 17+ Purespeed Firm Ground Cleats. These shoes are designed for lightning fast speed on firm ground surfaces. The cleats feature a techfit upper for superior stability and a comfortable fit on day one, with no wear-in time involved. For the ultimate in ball control, the non-stop grip (NSG) technology, is a thin layer of elevated dots that allow you to direct the ball with precision. The PURECUT laceless sock forefoot has no edges or laces that would get in the way to cause an inaccurate strike on the ball. Molding perfectly to your feet, the techfit compression knit upper allows for a flexible, comfortable feel when making plays. The SPRINTFRAME FG outsole is lightweight and allows for speed and traction on firm ground while the X heel lining ensures a locked-down, stable fit. Mercurial, volatile, unpredictable…that is exactly what you will be on the field when you lace on a pair of Nike Mercurial Vapor XI NJR FG soccer shoes. 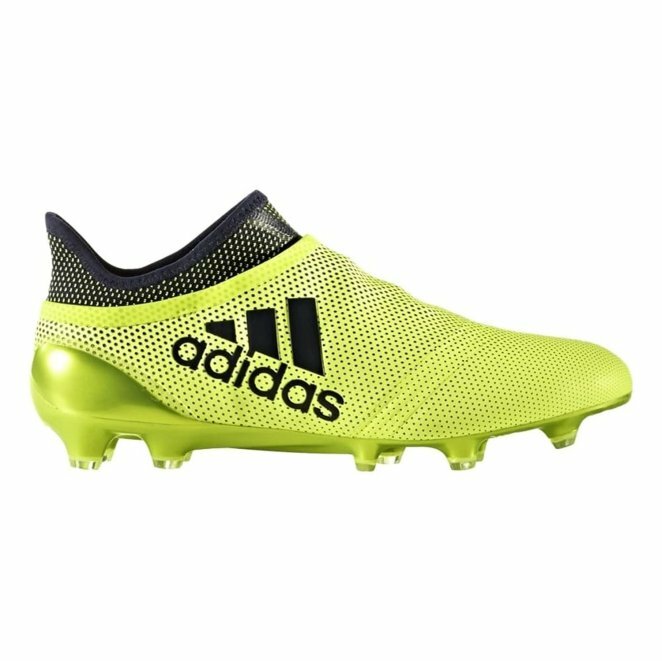 The shoes features embossed horizontal ridges and All Conditions Control (ACC) technology which allows for precise ball control, enabling you to make crisp passes and accurate shots on goal. The lightweight compressed nylon plate is anatomically shaped to contour to the foot. Computer modeling technology was used to develop the updated stud configuration for ultimate traction control and comfort. A locked-down fit is achieved with the tongueless construction that wraps the foot and the low-profile toe box helps you get under the ball for deadly accurate goal-bound shots. The anti-skid top cloth grips the foot to reduce any sliding in the shoes. 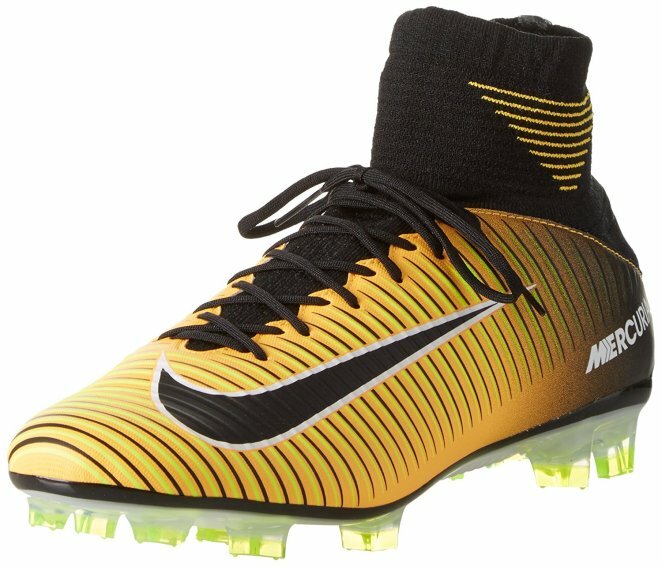 If you want to play like Messi, this is the shoe for you. 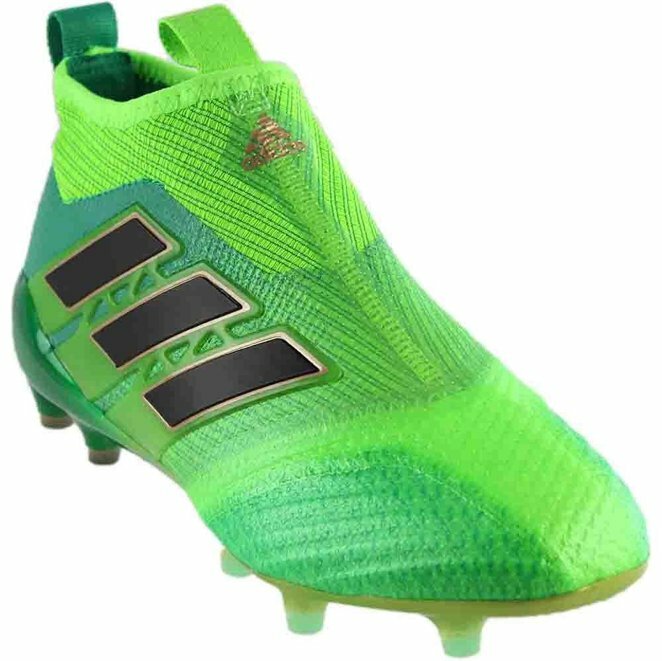 The adidas Nemeziz Messi 17+ 360Agility Firm Ground Soccer Cleats feature an AGILITYKNIT upper that has a perfect anatomical fit to your foot and is flexible so there is no wear-in time for the shoes. The 360 TORSION TAPE of the laceless 360 AGILITY BANDAGE SYSTEM allows for ultimate support and mobility, allowing your foot to bend and flex with ease and comfort during the most competitive plays. The Dual Lock Collar provides snug, stable support for the ankle while the lightweight messiGAMBETRAX 2.0 outsole allows for excellent traction on slippery, wet fields. These shoes are a game changer. The Adidas ACE 17+ Purecontrol feature a PURECUT Boost interior lining for a snug, comfortable fit that allows you to make quick cuts and burst of speed while reducing wear and tear on your feet. The laceless technology makes it one of the most popular shoes Adidas offers. The prime-knit upper offers comfort and flexibility ensuring your foot can make the most technical soccer moves and kicks with accuracy and dependability. The upper is also coated with Non-Stop Grip to allowing a much more controlled touch on the ball. True to it’s name, the Nike Hypervenom Phantom III FG Soccer Cleats will make you an apparition to your opponents and a deadly force on the field. The Flyknit upper offers breathability, support, and comfort while the Flywire cables wrap the foot, providing a locked-down feel. The shoe features foam pods which reduce the impact of running and return energy to you as you play. 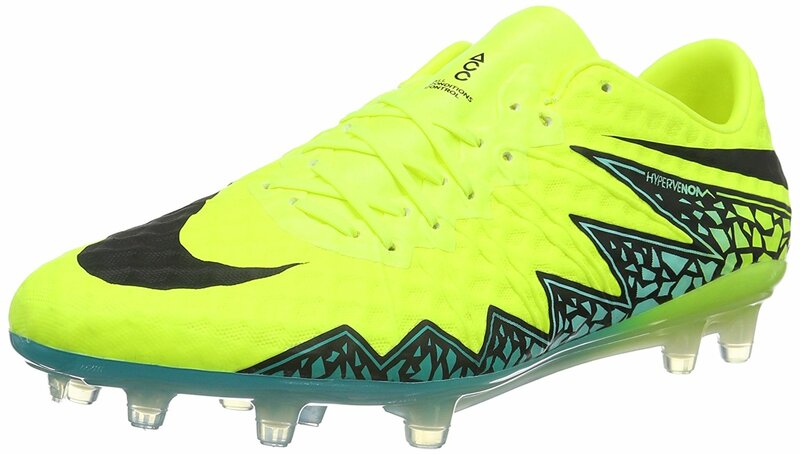 These premier soccer cleats cleat have a hybrid plate with a flexible forefoot for additional stability and a mixture of chevron and hexagonal studs that provide agility you can count on. These cleats have it all. The NIKE Men’s Tiempo Legend VII Soccer Cleats utilize a Flyknit constructed heel and tongue to add breathabilty, flexibility, and support. The premium, ultra-soft kangaroo leather with interior quilting adds a cushioning to the shoe that allows for a comfortable feel and a soft touch on the ball. 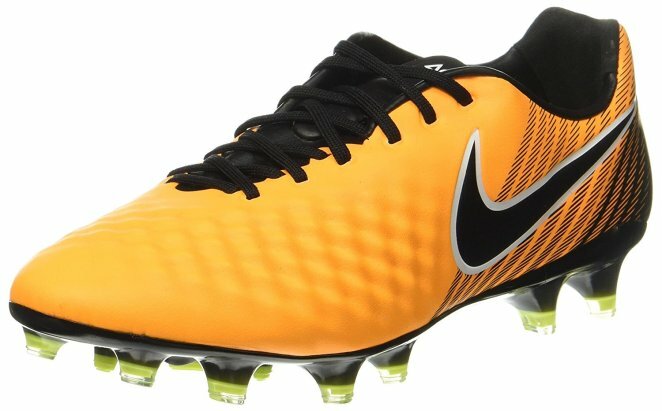 The cleats employ flywire cables that work with the laces to ensure a locked down fit. The NIKEGRIP technology uses interlocking textures to further eliminate any sliding of the foot in the shoe. Stability pods inside the shoe collar provide support for the ankle and the molded sockliner reduces pressure from the cleat studs and increases comfort. The Hyperstability plate that runs along the length of the shoe provides lightweight traction. The cleats feature both detachable aluminum studs and fixed studs that provide traction on soft, muddy surfaces while the Anti-Clog Traction on the soleplate helps prevent mud from sticking. This shoe will elevate your firm ground play to the next level. 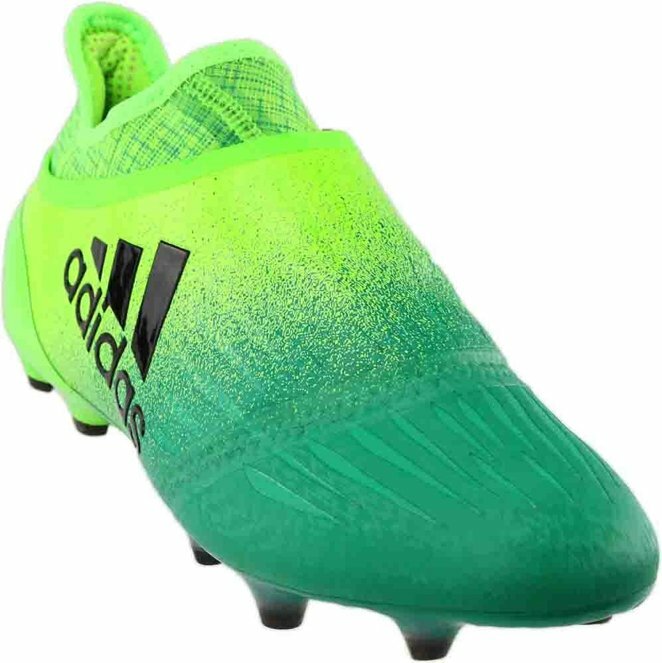 The adidas Predator 18+ FG Soccer Cleats comes with a Primeknit upper that molds to your foot, increasing comfort and decreasing the break-in time of the shoe. A major advantage of these shoes is the Purecut laceless sock forefoot which has no edges or overlay that would be detrimental to ball control. The comfort and responsiveness of this shoe is remarkable, with a layer of Boost Foam added to the sockliner and outsole. The Sprintframe outsole is lightweight and provides serious stability when running at speed. 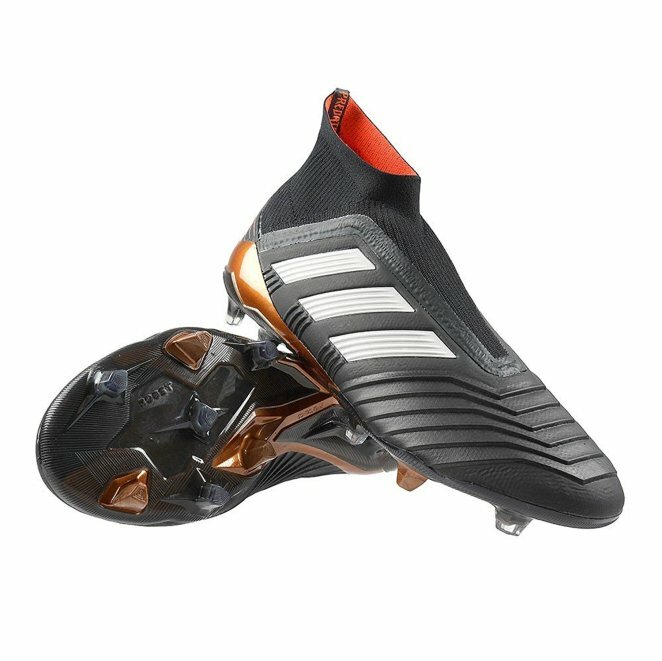 The adidas Predator is perfect for firm ground play, with the Total Control stud alignment providing traction and stability when making quick stops and changes of direction. 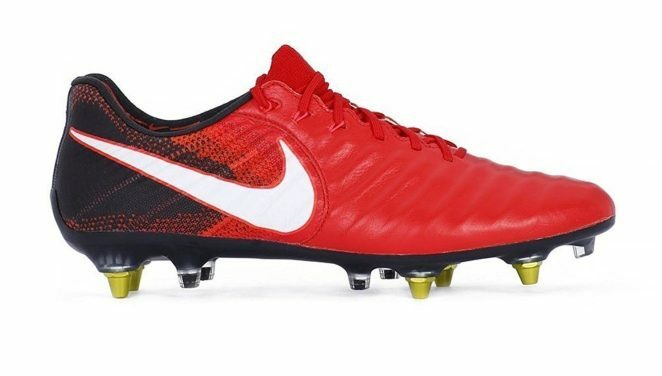 These cleats will turn you into the explosive, dynamic player you know you can be. 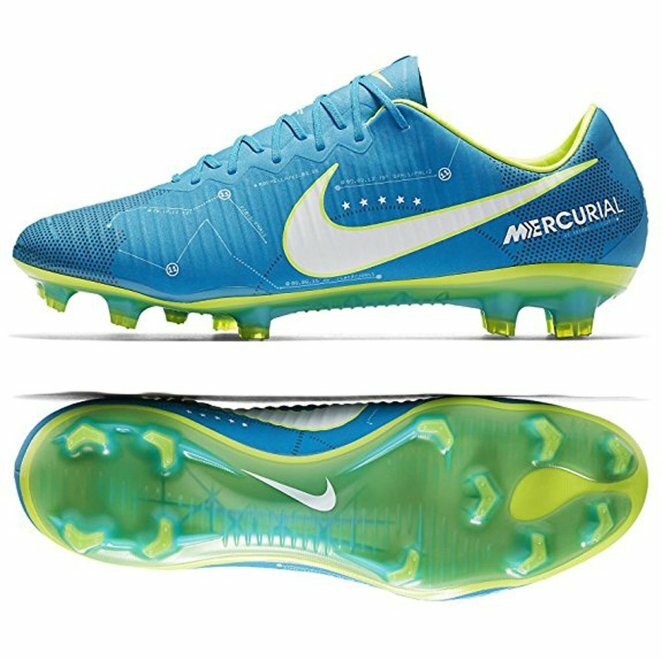 The Nike Mercurial Superfly Leather FG Soccer Cleats feature a leather upper and a one-piece, tongueless design which provides a snug fit, enabling you to make the quick stops and turns needed to rise above your competition. The ultra soft leather provides an extra comfortable feel, ensuring your feet stay fresh and loose for the entire soccer season. The Dynamic Fit Collar ensures a locked-down fit while the contoured sockliner adds cushioning that will enable you to be able to play at peak performance late into the game. The carbon-fiber plate in the shoe is highly responsive and allows you to hit your top speeds without a problem. The direct-inject blades make you able to execute the sharpest turns and most technical plays on any firm ground, natural surfaces. Buyersguidepro.com participates in the Amazon Services LLC Associates Program, an affiliate advertising program designed to provide a means for sites to earn advertising fees by advertising and linking to Amazon.com. Amazon and the Amazon logo are trademarks of Amazon.com, Inc. or its affiliates.